Learn tips and best practices below to manage Epics and track blockers within your Sprint to cut down on meetings. Creating two pipelines helps organize Epics. Epics aren’t meant to move throughout your Board, but be the vessel to help you track user stories and key projects in a central location. When you nest Epics, teams get a complete understanding of the intricate nature of how work intertwines. Developers understand how a small user story rolls up into a larger piece of work; while Project and Product Managers can track overall progress, visualize where in the workflow work is, and spur conversations around blockers, or potential roadblocks that might be impeding progress. In a Sprint, you should have a prioritized Sprint Backlog, but there might be work within the backlog that is dependent on work already in progress. 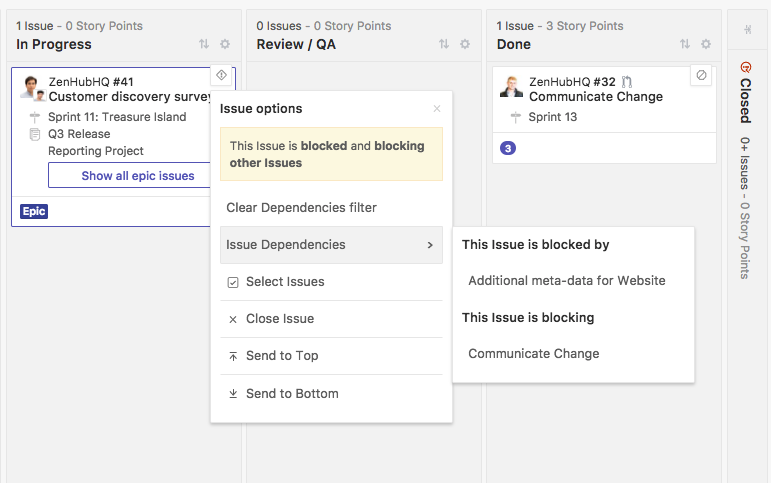 Once dependencies are created, you can filter blocked and blocking relationships using filters through the icons located on the top right of an Issue card to easily understand what should be worked on next. Creating dependency relationship can help cut back on meetings, relay critical information for remote team members, and is a great way to understand the relationship between work to speed up software cycles. 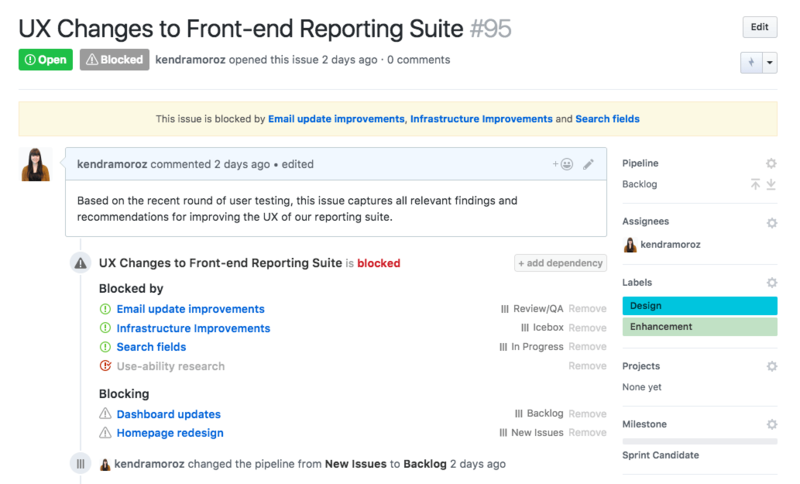 Project and Product managers can also easily see where they need to unblock teams. Can I use Dependencies on the Boards with no milestones, releases and story points? You can absolutely use Dependencies without other functionality for reporting in ZenHub! There’s no obligation to use estimates, releases, or reports. We encourage it to help your team get more predictable with software cycles, but you can certainly get started with just the Board! Every filter that gets added to the Board or a report gets added to the URL in your browser as well! Simply bookmark this in your Browser to be pulled up again. Do issues have to live in only one Release? Nope! You can have an Issue in more than one Release. We recommend adding notes in the Issue about the impact it will have on both Releases to keep up team communication. You can learn more about Releases here.